Obituary for Merl Ginter | Herald & Stewart Home-Funerals, Inc.
Merl Everman Ginter, widow of Robert T. Ginter, of Mt. Sterling, passed away Sunday, February 3, 2019. 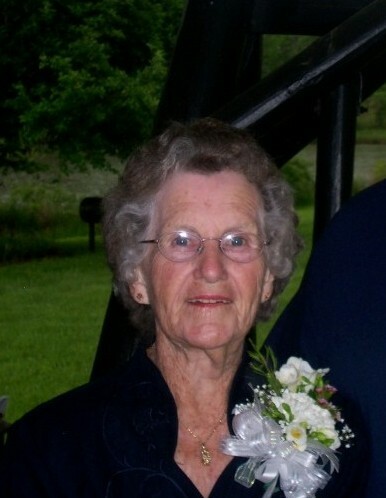 She was a 91 year old native of Bath County, daughter of the late Harmon and Bernice Butcher Everman, as well as a former seamstress at the Jockey Sewing Factory. She is survived by 2 sons, Larry (Mary) and Robert L. (Julie) Ginter, 4 grandchildren, Melissa (Randy) Johnson, Kenneth (Kim) Ginter, Robert A. (Samantha) Ginter, and Lyndsey (Matthew) Lewis, 3 great-grandchildren, Jessi Laura Ginter, Blakely Kate Lewis, and Kennedi Johnson, and a brother, Homer D. (Faye) Everman. She was preceded in death by an infant sister and 2 brothers, Earl and Burl Everman. Her funeral will be 2:00 Friday at Herald & Stewart Home for Funerals, with burial to follow at Machpelah Cemetery. Visitation will be 5:00-8:00 Thursday.